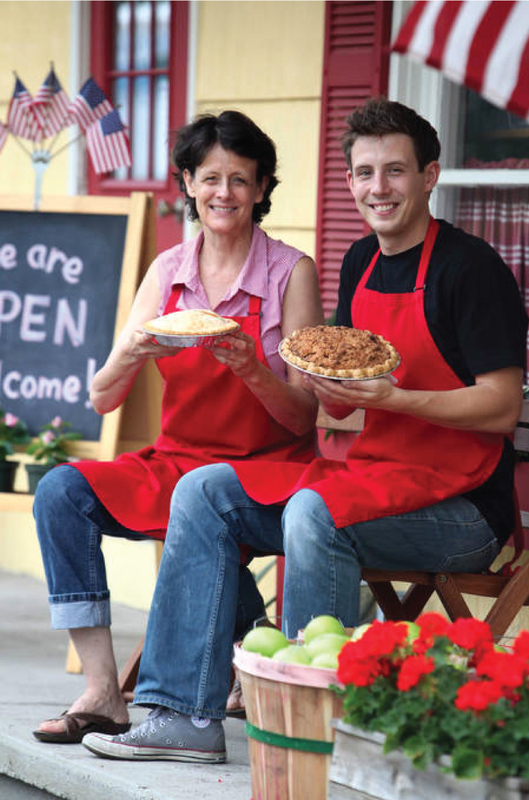 In the early 1990s, when Wil Tyler was a boy, his Mom started baking pies. She learned the art while studying in England and working in the college kitchen. There she watched the lead baker, a woman who made huge batches of all-butter pie crust and who 'didn't even measure the water' in her recipes. 'People have such trepidation about pie crusts, yet this lady was fearless. I didn't come back with a recipe, but I came home inspired by her style -- by her fearlessness,' Deborah explains. First he asked her to teach him how to bake the pies. She did, but she wouldn't stick around the kitchen. Then he asked her for her recipes. She shared them, but she wouldn't linger over them. Then Wil started baking the pies himself and he got some sales going at a local holiday craft fair. 'A lot of people remembered my Mom, and they'd say, 'Oh, The Pie Lady is back! ', even though it was really just me,' says Wil. For Thanksgiving in 2009, he got orders for 30 pies. With no experience and a tiny oven, he begged his mother to come help him. When she saw what was was coming out of the kitchen, she said, 'There's no way you're going to sell these pies under my name.' And she came back.